The San Francisco Chronicle's most popular film critic, Mick La Salle is known for his unusual taste in film and for his ability to defend his opinions. But the reason La Salle has such an unusual take on modern film lies in this book; his real area of expertise is rooted in in a certain kind of Hollywood film made during 1929 and 1934 (otherwise known as the pre-code era). 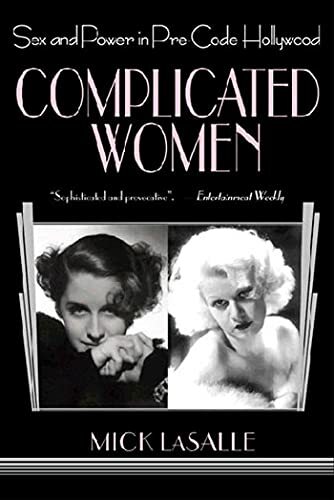 His first book "Complicated Women" talks about the various roles that actresses played during these days, from "vamps" to housewives, and focuses on two of his favorites, Greta Garbo and Norma Shearer. It's a great combination; Garbo has been overly exposed and mythologized to the point of being beyond human, while Shearer has been unjustly neglected. La Salle restores them both to human capacity. Vigorously researched and cleanly written, this is one of the best books of its kind. It also contains a collection of lovely photos in the center. La Salle wrote a follow-up book, "Complicated Men," that I have not read yet.